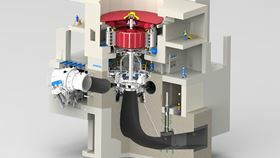 A 3D model of an Andritz pump-turbine. Andritz has secured an order from China’s Shaanxi ZhenAn Pumped Storage Co Ltd to supply four 350 MW reversible pump-turbines and motor-generators, along with auxiliary equipment, for the ZhenAn pumped storage hydropower plant in Shaanxi province. The four 350 MW reversible pump-turbine units will operate with a water head of 440 m. The first unit will be commissioned by the end of March 2023, and all units will be put into commercial operation by the end of December 2023. The contract is valued at more than €100 million. ZhenAn, with a total installed hydropower capacity of 1400 MW, will be the first pumped storage power station in northwest China. Shaanxi ZhenAn Pumped Storage Co is a subsidiary of State Grid Corporation of China (SGCC). The Andritz scope of supply includes two MC pumps.